Hello, hello hello – what is going on today? I got a great workout in this morning and it’s so ironic – the instructor said – today is the day you write a new chapter… and this is what I want to talk to you about in this episode! From my perspective, this is a game changing concept, and I can’t wait to share with you. It was for me – and I hope you for you as well. how you can actually change it. Yes – keep listening and I will tell you how to change your past.. such fun. Now, I always tell you guys how I’ve used – or currently use, the tools I share here, and today I will be share examples of how my coach recently pushed me with these ideas. it took my coaches to point it out to me from and outside perspective and it was like – ohhh… now I see it..lol..
That is the beauty of doing this work one on one with a coach. how often do you think of your past? we just mindlessly go through life on autopilot thinking life just happens to us. But really, what is going on, is we hold these thoughts so true to us, that, we don’t even realize how much they influence our life. No kidding you might say. Ok, fair enough..lol.. But then my next question is – how often do you tell a story about how the past made you who you are today? And is the story you tell a good one? I am going to suggest – your past no longer affects you. like what is she saying? You heard me correctly – your past does not affect you in this moment. Your thoughts about your past. Seriously.. I want you to stay with me here – because for some of you, you may think about something in your past that actually causes you to over drink, or over eat. 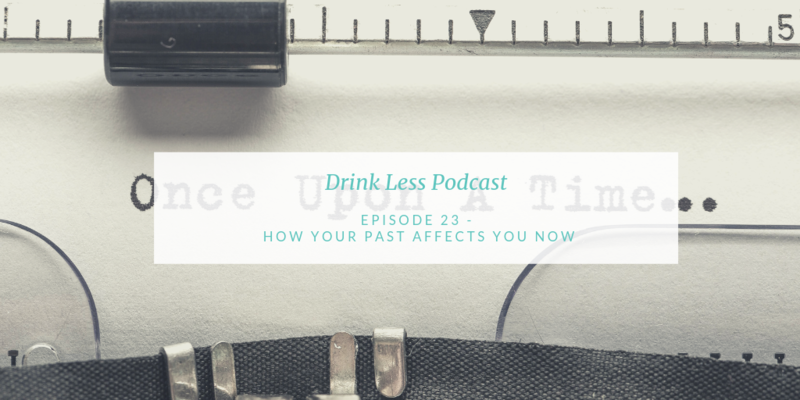 Because here’s what happens – you want to escape whatever the feelings are that come up from your past and head to the alcohol or food as a way to cope. And honestly, when I say past – it could be any time frame – from like childhood to yesterday. Your past only exists in your mind. Consider this – I could tell you a story about my past that says something like – I was such an amazing sister – when my little brother wanted to play with me, well sometimes I would let him, but sometimes I preferred to be with my friends playing teacher. Now he would tell the story something like – every time I would run down the hall to play with her and her friends she would slam the door in my face…hahaha.. true story. and how you tell your story. Now remember – all thoughts are optional. We have this amazing brain, yet we hardly use it to it’s fullest capacity. Let’s start working on programming it in a way that makes our lives amazing ok? like I was told as a kid to look both ways before I cross the street…lol..
I’m going to continue to hold on to that one. again, I’ll keep both of those. these are all optional thoughts. And pay attention to the results you get in your life when you are thinking like this. The other thing we often tell in our past story is – how it “should’ve been”. and usually that kind of thinking line causes anxiety – or some sort of negative feeling. But, What if the past should’ve been exactly as it is? You know what I ask? Thinking it should’ve been different is an argument you will never win. a new sense of empowerment. OK, I said I would share my latest transformation..
see – all of this work is like layers on an onion.. you keep pealing back as you do it, and get to the really good stuff. it typically goes to the next level as they see how much is truly possible in their lives. So, -for my recent example – I was talking to my coach about how I always thought I should’ve been a mom. And remember how I mentioned in the beginning of the podcast sometimes you don’t even see how your own thinking influences your life? now I thought I had self coached pretty well on not having kids, and where we are in life – today. or it was just not meant to be. But my coach pushed me to dig into how I tell the story of when we were trying to have kids, and what my thoughts are about it. Because again – you guys – my belief was – I should’ve been a mom. And since I wasn’t, I failed. What if – I was never supposed to me a mom and my thinking was just confused? Maybe then I wouldn’t choose to think I was a failure right? And I always tell the story that my job was mainly the cause. That I couldn’t get the time off for all of the treatment requirements. That my schedule was too crazy. And my list went on. My thought of I’m a failure transferred into other aspects of my life – and I had an underlying blame of my job at the same time. But the truth is – I stayed in my job at the time. well I nursed something – but it was more like my wine! Lol..
See – I can actually chuckle today because I have changed my past in the way I tell my story. Because here’s the thing – and this is what I encourage you to do this week. You can be the victim, or the heroine. So for me – nothing has changed in my past. You know, as a little girl I thought I was going to be a cool PTA mom. Instead I have an amazing life which I never could’ve imagined. I can go on to tell you how I have been able to serve on a board of a foundation that helps children with cancer. It feels so much better, and I have to tell you – it really has allowed me to step up and own that I am a professional woman looking to make a difference in this world. My story isn’t exactly what I originally thought – but guess what – it might be better than I ever imagined. So, here are some things to consider as you tell your story. Think of a story you tell from your past where you feel regret. Write it the first way. Now go back and tell it again without the feeling of regret. Like – how was it perfect for you? and you get to leave the rest. When you retell your story as the hero you can be so much more empowered. And when you are feeling empowered you are much more likely to truly work on creating the life you desire. Today is not only the day you can start a new chapter – it is also the day you can re-write an old one. Don’t forget – if you haven’t downloaded the free guide to drink less yet – well what are you waiting for? Lol..
Head over to mindfulweighs.com/freebie – when you sign up you get the guide and you are placed on my email list, where you can get other free content throughout the week.